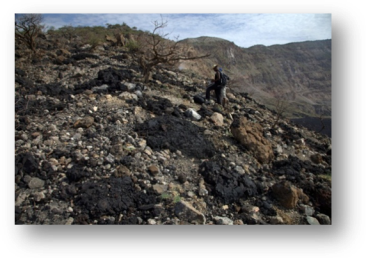 The 2011 eruption of Nabro volcano in Eritrea is of great scientific interest and has had substantial impacts in the remote part of Afar in which it is located. It is sited in the extensional zone of Afar, close to the Mesozoic crustal block of the Danakil Alps. It is a predominantly trachytic edifice, with an 8 km wide caldera and ignimbrites (Wiart & Oppenheimer, 2005). The current eruption began shortly before 20:42 UTC on 12 June following intense seismicity. It is the first eruption of Nabro on record, highlighting the potential of caldera systems to erupt without warning. It is also the first seismicity of note recorded in this part of the rift. Comparatively little is known about magma differentiation, storage and transport mechanisms and eruptive processes in such tectonic settings. 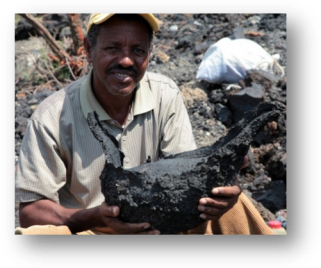 Investigate the event in the context of regional extension and proximity to the Danakil Alps. This brief report summarises the achievements of a successful field campaign in Denkalia. 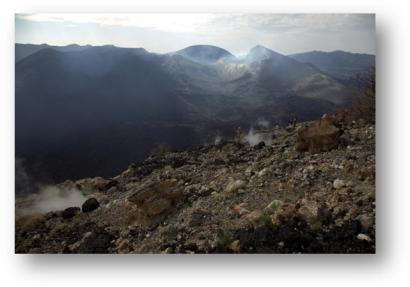 The key aims were to document the aftermath of the June/July 2011 eruption of Nabro, to assess the current state of activity, to service the local seismometer network, and to collect a suite of samples of 2011 products along with older volcanic rocks on Nabro. 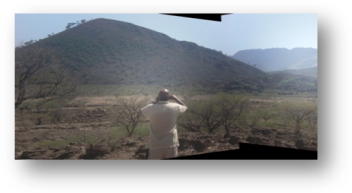 The fieldwork was conducted between 8 and 15 October (we left Asmara on the 7th and arrived back on the 16th). We had two 4WD vehicles at our disposal and based ourselves first at Afambo and later at Wade. In between, part of the group spent a night on the caldera rim at the abandoned military camp. Berhe and James focused on servicing the seismic network, while Goitom, Ermias and Clive concentrated on sampling of lavas and tephra. Our drivers were Alem Teklemariam and the irrepressible Asresehey Ogbatsien. We were wonderfully supported back in Asmara by Dr. Ghebrebrhan Ogubazghi. We are grateful to many others who assisted and supported our mission, especially Dr. Alem Kibreab (Ministry of Mines and Energy, and Isaac Tuum (Administrator of Central Denkalia subzone), and the several military officers and soldiers and local guides who accompanied us in the field. 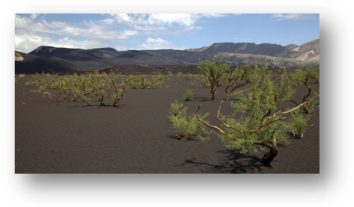 Given the limited time spent in the field, the extent of the lava flow fields and tephra fall, and the proximity of the international border, a comprehensive sampling strategy was impractical. We did, however, sample lavas and tephra over quite a wide area within and beyond the caldera. 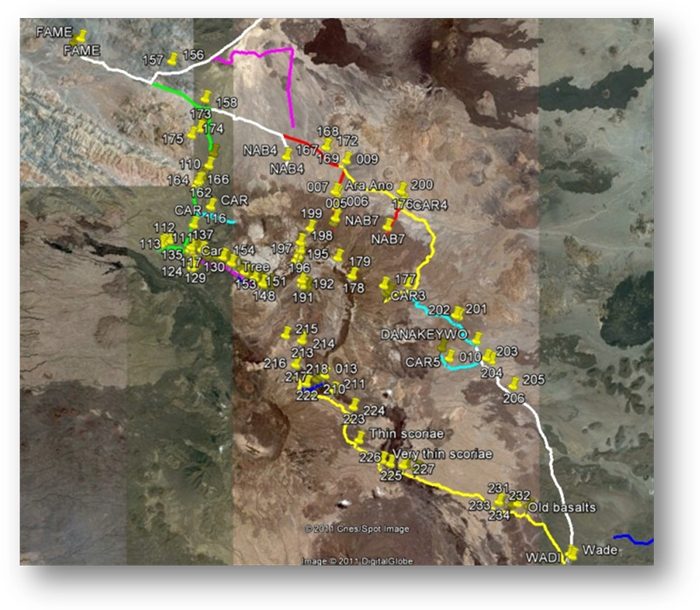 The figure (below) shows our GPS tracks and sample locations. The main lava flow extends for ~17.5 km and its width exceeds 1 km in some parts. Meaningful estimates of thickness were not possible in the field but flow margins were typically 5–10 m thick. Thicknesses in the interior could be substantially greater. The flow surfaces were well above ambient temperatures in places, and were still emitting fumes. The main (longest) flow was sampled towards its front. Within the caldera, three shorter flows were sampled. Compositions range from trachybasalt to basaltic trachyandesite. Front of the main (longest) lava flow. Note Ermias for scale. The main lava flow has overrun agricultural and settled areas within and beyond the caldera. It has also engulfed drainages. View of the vent region within the caldera. Note shorter lava flows. Tephra from the 2011 eruption fanned out towards the SW sector of the volcano. In the NE sector of the caldera floor, there is no trace of the eruption and people were still in residence. We found a bomb field within 1 km of the vent, and near Sireru on the SW part of the caldera, damage to tree branches suggested bombs had fallen there, too (they were presumably buried by subsequent scoriae fallout). Lava bombs within 1 km of the vent area. 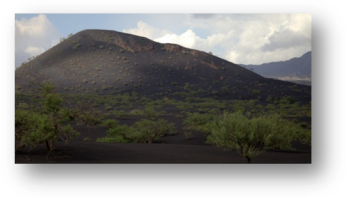 The mantle of dark scoriae reaches up to 2.5–3 m near Sireru based on the depth to which acacia and other trees were buried (amazingly most of the trees had new shoots). Before and after view from more or less the same spot near Sireru. Pre-eruption shot courtesy of Berhe Goitom. Partially-buried acacia trees and buildings near Sireru. The 2011 vent region had a distributed fumarole field, with a number of incandescent vents. The plume associated with these was visible drifting across the international border on some days. The lava flows were still degassing in many places, some marked by deposits of bright yellow/orange condensates. Night-time view of the vent region in the centre of the caldera, seen from the caldera rim. Mofettes at the edge of the bomb field. At least one was present before the eruption, and was used therapeutically by the local population. But we were told that others were new. The established one also seemed too hot to be bearable suggesting temperatures have increased. 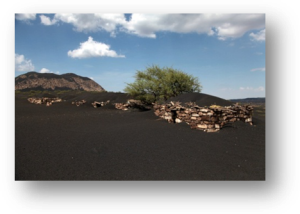 We opportunistically sampled pre-2011 lavas and tephra in several locations. In particular, we recorded stratigraphy and sampled ignimbrites exposed on N, E and S flanks of Nabro. Both the Eritrea regional network and the local Nabro network were serviced during the fieldwork. The Eritrea regional network was working well with no problems reported at any of the stations. Five of the Nabro seismic stations were working well with no problems. Station 6 was completely flooded after recording one week of data. This station was removed and taken back to Asmara. Station 7 had problems with timing that could not be fixed and station 8 had minor data logger problems though no data were lost. Given the intermittent local seismicity (e.g., mid-September, early November), high-temperature degassing in the 2011 vent region, sustained MODIS thermal anomalies, and reports from the local administration (30 October) of "smoke" and "noises" (corroborated by infrasound records for 27–30 October), it seems prudent to consider the possibility of further eruptive activity at Nabro during the next year or so.